The biopharmaceutical manufacturing industry has undergone many changes over the past decade, ranging from better expression systems to new modular and flexible facilities and the emergence of single-use devices. Each of these trends, however, is being driven by the need for productivity and efficiency, according to BioPlan Associates' 12th Annual Report and Survey of Biopharmaceutical Manufacturing Capacity and Production¹. Although some respondents continue to indicate they must first address acute pains such as improving their downstream processing bottlenecks and reducing costs, once these areas are attended to, we expect to see continued strategic focus on general productivity. For technology innovators and suppliers, this essentially means any new product will need to clearly demonstrate how it will improve a facility's process efficiency — not just how it will lower operational costs. Some of the interesting (and likely short-term) trends related to acute operational problems include downstream processing emphasis (ranked #6 in last year's study), and a drop in interest in biosimilars (See Figure 1, ranked #2 last year). This year's top trends are all related in their drive for greater efficiency and productivity in the manufacturing process. With that in mind, we delve into several of these top trends to identify the ways in which they are helping transform production strategies. Our annual survey identifies reasons single-use devices have enjoyed rising penetration rates in recent years: More than two-thirds of respondents this year (69 percent) report "significant" or "some" improvements in biomanufacturing performance at their facility over the past 12 months owing to the use of disposable devices. Closely following, 68 percent report some level of performance improvements from overall better control of processes. These were top areas most manufacturers associated with performance improvements in last year's study, as well. The 2015 data are broadly consistent with last year's results, though not without some movement. This year for example, fewer respondents attributed performance improvements to use of disposable devices and better control of processes, despite these remaining the technologies contributing to improvements for the largest share overall. What's the primary reason? More than 90 percent of facilities are using single-use/disposable technologies in some capacity and are now simply evaluating "how" and not "if" they will integrate them more comprehensively into their bioprocessing strategy. The 12th Annual Report reveals a large percentage of the industry is actively modeling future manufacturing strategies, as they compare "stainless-steel" options versus "single-use/disposables" technology. The study also identified areas that respondents feel are actually improving performance. For example, this year 66 percent attributed improvements to better analytical testing. This was consistent with perceptions in past years. Not too surprisingly, single-use devices continue to disproportionately benefit contract manufacturing organizations (CMOs), where 86 percent were reporting improvements to their productivity, compared with biotherapeutic developers (66 percent). These disposable devices are well suited to the CMO business model that deals with multiple products and requires fast turn-around times. In general, CMOs tended to see more improvements from the factors we identified than developers, likely due to their being involved with more products and bioprocesses and therefore having more opportunities to see improvements. These improvements come from a broad range of areas such as better design of experiments to improved validation services. On the other hand, biotherapeutic developers are seeing greater improvements than CMOs from optimized cell culture processes and more automated control of processes. Overall, it's encouraging to see that the industry is experiencing manufacturing performance improvements from such a broad range of factors: Of the 15 areas measured, a majority of respondents noted specific improvements owing to implementation of at least 10. This represents the broad focus on bioprocessing efficiency and productivity, with biomanufacturers seeing results from areas ranging from more automated control of processes to better operations staff training. These incremental improvements compound over time to result in more streamlined manufacturing of these biopharmaceutical products, which are accounting for an ever-growing share of the pharmaceutical product pipeline. Although we have seen downstream processing (DSP) crunches as far back as eight years ago, these had moderated to chronic bottlenecks being dealt with incrementally. This year, one of the biggest changes we note is the surge in demand for better downstream processing. This is mirrored in the respondents' identification of bottlenecking causes. For example, 35% of biomanufacturers this year indicated that lack of downstream equipment capacity will be a critical bottleneck over the next five years. This is up from 29 percent in 2014. As shown in Figure 1, downstream problems were noted by 11.7 percent as the single largest trend —this almost doubled since 2014's share (6.5 percent). The interest in downstream processing advances isn't surprising given its continued role as a capacity bottleneck, as yet unable to keep up with recent improvements in upstream operations, which are now less of a pressing interest for biomanufacturers. Some facilities are evaluating the effect of increasing upstream productivity/titers, and whether this can prove to be less cost-effective overall, as increased titer adds more complications and stress to downstream processing and moves facilities past the ranges at which their downstream processing encounters bottlenecks. We have heard, anecdotally, that facilities are having to dilute bioreactor output in preparation for purification processes as a result of higher titers and concentrations. There does not appear to yet be an industry consensus that higher expression yields and process stream concentrations will be useful at commercial scale, especially for more potent drugs that require less total bioproduction API quantity. As Margaret (Colleen) Dodson, senior process engineer at Biogen, notes: "Cell culture titers continue to increase year after year, meaning that companies will need to adopt technologies and practices that accommodate the higher throughput, while minimizing production bottlenecks." BioPlan Associates' 12th Annual Report and Survey of Biopharmaceutical Manufacturing Capacity and Production also evaluated the overall impact that downstream processing is having on facility capacity; seven in 10 respondents this year indicate that their facility is being adversely impacted, to some extent. That includes 12 percent who report "serious" bottlenecks owing to downstream processing; the highest figure we've witnessed going back at least as far as 2008. Indeed, compared to last year, more respondents appear to have moved from the "some bottleneck problems" column to the "serious bottleneck today" group, a result that is likely driving this year's interest in downstream processing advances. Perhaps more telling, the #1 area that the industry believes must be addressed to avoid capacity constraints is to develop better downstream technologies. This was noted by 41% this year; and the 2nd most important area to address, out of 20 different areas was to optimize DSP systems (See Figure 2). With a large proportion seeing the value in optimizing systems to improve downstream purification performance, it's clear that the industry is targeting downstream performance improvements to ensure more efficient overall bioprocessing. Among the dozens of other DSP technologies being considered, disposable products are also squarely in the mix, including disposable UF systems and single-use disposable TFF membranes, filters and prepacked columns. New downstream technologies are also top of mind when it comes to the new products and services that manufacturers want their suppliers to focus their development efforts on. In fact, the top innovation areas requested by the industry both relate to downstream processing: Disposable purification products and chromatography products (each cited as a top-5 demand by 36 percent of respondents). Biogen's Dodson notes downstream advances likely to be adopted on the horizon include "the use of in-line probes that provide real-time data and allow for less manual measurement… to decrease error and speed up the manufacturing process." Many large companies are also investigating new membrane adsorber technologies that have the capability to replace chromatography column operations, which would greatly reduce cost and production time. One of the interesting ways in which downstream challenges are changing production strategies relates to protein A usage. Over the years, we've seen a considerable amount of interest in alternatives, with 20-30 percent of the industry professing to be investigating these as a way to improve their downstream performance. The high costs with Protein A resins involve not only to their high purchase and recycling costs, but also their high costs for use. Protein A productivity — including process time and rates — is a problem with current resins, and may be an area where alternatives could see rapid adoption if offering improvements. Each year, though, few respondents actually report having made the switch to Protein A alternatives at any production scale (1-in-12 this year, roughly in keeping with years past). No alternatives currently threaten Protein A's commercial dominance, and there remain considerable opportunities for improvements and innovations, although we note several incremental advances in Protein A resins in the past decade. As with most novel technologies in biomanufacturing, if Protein A alternatives are to be adopted, they will be for new rather than existing production units. Respondents were roughly three times more likely to consider alternatives to Protein A for new production units than for existing production units. With just a small percentage of the industry agreeing that they would be moving away from Protein A for existing scale-up or commercial production units over the next 12 months, this market is unlikely to see rapid changes. However, this is an area worth tracking, as the industry continues to investigate alternatives to this production platform. One of the challenges with Protein A lies in its high cost, and reducing manufacturing costs is the third largest industry concern this year, up a spot from last year. This year, we continue to see the industry place its cost-cutting emphasis on reducing operating costs, although fewer reported having implemented such programs over the prior 12 months relative to past surveys. Manufacturers are also reducing process development times and cost and negotiating harder with vendors, much as they were last year. Various programs such as "lean manufacturing" programs, operational excellence programs (such as Lean, Six Sigma) were reportedly adopted by slightly more than one-third of respondents. For the most part, the implementation of cost reduction methods declined again this year, perhaps as a natural by-product of the best-performing measures having already been investigated in previous years. One exception is outsourcing of manufacturing, with a growing share of respondents this year reporting having outsourced manufacturing to domestic service providers to cut costs. However, overall, these were near the bottom rung of cost-containment measures, suggesting that outsourcing is not a top priority for cost-cutting and tends to be viewed more as a strategic calculus. This is supported by data showing that once-core activities such as process development services have been outsourced to greater degrees in recent years. Nevertheless, the growing share of respondents outsourcing manufacturing (and process development jobs) for cost-containment purposes suggests that while savings may not be the primary impetus behind outsourcing, some respondents are realizing benefits in this area, too. Regardless, the growth of the outsourcing market in recent years — and higher reported spending on outsourcing — is a testament to this being a critical trend driving changing production strategies, allowing manufacturers to hone in on their core strengths while also developing partnerships that allow them to access critical expertise and technologies they may no longer have in-house. Another cost-reduction method reported by a larger proportion of respondents this year was accepting single-use (disposable) systems (SUS) into commercial manufacturing, noted by about 1 in 5 respondents. While single-use implementation and integration is only the fourth-largest trend cited by respondents to this year's survey, there is little doubt that this is one of the biggest trends of the past few years, leading to an overhaul in production strategies for early-stage production, and with the likelihood of also transforming commercial manufacturing in coming years. For the time being, single-use remains a much greater force in clinical than commercial production. Last year's survey respondents, for example, estimated that single-use components and devices comprised about double the percentage of facilities' clinical than commercial production operations for both upstream (39 percent clinical, versus 23 percent commercial) and downstream (34 percent, versus 17 percent) operations. Indeed, users of various disposable devices this year report higher levels of penetration in scale-up and clinical production than in commercial production for every device we measured. This was particularly the case for disposable bioreactors, which are used in scale-up and clinical production by 81 percent of users but in commercial production by slightly under one-third. Similarly, disposable chromatography devices are being put to use significantly more in scale-up and clinical production (55 percent of users) than in commercial production (12 percent). Once again, though, the single most important reason for increasing use of disposables is to reduce capital investment in facility and equipment. This has been the top reason each year going back at least as far as 2009, suggesting that the industry is looking at disposable options from an economic rather than technological perspective. As such, the industry's focus on productivity and efficiency is itself a driving force behind mainstream adoption of single-use devices, which are being viewed primarily for their potential economic and productivity benefits even as other attributes are recognized. This harks back to the finding that more than two-thirds of survey respondents realized manufacturing performance improvements last year owing to their use of single-use and disposable devices, with this being a contributor to performance improvements for more respondents than any other factor. There's no doubt that the emergence of single-use and disposable devices has resulted in a shift in production strategies at many facilities around the world. According to Biogen's Dodson: "Single-use technologies have allowed our company to more nimbly produce clinical material at the 2000L scale. By not having to validate cleaning of stainless-steel equipment or invest in expensive and time-consuming changeover activities, we can realistically move from one clinical campaign to the next with minimal effort. This has led to increased facility usage, and less of a burden on our commercial manufacturing suites." While suppliers continue to work on better-performing single-use and disposable applications, we note that the industry's focus lies more on these applications' implementation and integration than on "better" devices. As such, users may already be comfortable with the benefits current devices afford, and are instead looking for standardization before mainstream adoption in commercial manufacturing can be achieved. Once standardization occurs, we may soon see fully single-use facilities. In fact, roughly half of respondents this year agree that they expect to see a 100% single-use (disposable) facility in operation within five years. The biopharmaceutical manufacturing industry has witnessed substantial changes in recent years, from improved upstream titers to the advent of single-use/disposable applications. While the focus has shifted to downstream processing as part of the consistent effort to increase productivity and efficiency, there are also other changes afoot. The emergence of single-use devices, for example, appears to dovetail with a broader industry trend towards flexible, "modular" facilities. And as the biopharmaceutical industry — and pharma sector as a whole — moves further away from blockbuster drugs and to more targeted therapies, we may see a similar shift in manufacturing paradigms, towards smaller, flexible facilities that spring up around the world, capable of handling multiple products and dominated by single-use and disposable devices. In fact, single-use technologies are now a top area of interest and investigation for fill-finish operations as well. At the same time, new trends and advances are making continuous bioprocessing more cost-effective, and the industry may in time develop the technologies that close the gap with other manufacturing industries where this is already common, such as food and automobiles. Besides the potential cost-savings, continuous bioprocessing can result in better-quality products due to higher purities and lesser impurities. This again feeds into the industry's more flexible future, as continuous bioprocessing is more easily adopted as a manufacturing platform than batch processing. In the personal view of Jian Irish, VP of technology transfer, Biologics at Sanofi, "Technology investment has shifted to gain a competitive edge in manufacturing costs, such as cell line productivity, disposable technology and continuous downstream processing." The 2015 12th Annual Report and Survey of Biopharmaceutical Manufacturing Capacity and Production yields a composite view and trend analysis from 237 responsible individuals at biopharmaceutical manufacturers and contract manufacturing organizations (CMOs) in 28 countries. The methodology also included over 164 direct suppliers of materials, services and equipment to this industry. This year's study covers such issues as: new product needs, facility budget changes, current capacity, future capacity constraints, expansions, use of disposables, trends and budgets in disposables, trends in downstream purification, quality management and control, hiring issues, and employment. 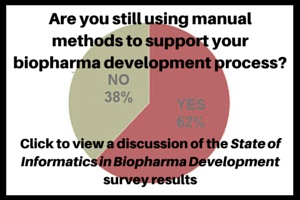 The quantitative trend analysis provides details and comparisons of production by biotherapeutic developers and CMOs. It also evaluates trends over time, and assesses differences in the world's major markets in the U.S. and Europe. All in all, it's an exciting time for the industry, which — despite its reputation as slow-changing — has seen trends in recent years beginning to transform production strategies. All signs point to a continued transformation in the years to come. Jean-Claude "JC" Lupis, director of Data Insights, BioPlan Associates Inc. Experienced market research and data trends analyst, author and editor, JC is a Columbia University master's graduate, with background in life sciences, marketing and international politics. Eric S. Langer is president/managing partner at BioPlan Associates Inc., a biotechnology and life sciences marketing research and publishing firm. He is editor of numerous studies/reports, including "Biopharmaceutical Technology in China," "Advances in Large-scale Biopharmaceutical Manufacturing." Contact: elanger@bioplanassociates.com.